Local 1935 members Dakota Gardner (L) and Scott Weik inspect the sixth green at Goodrich, which they rebuilt last summer. 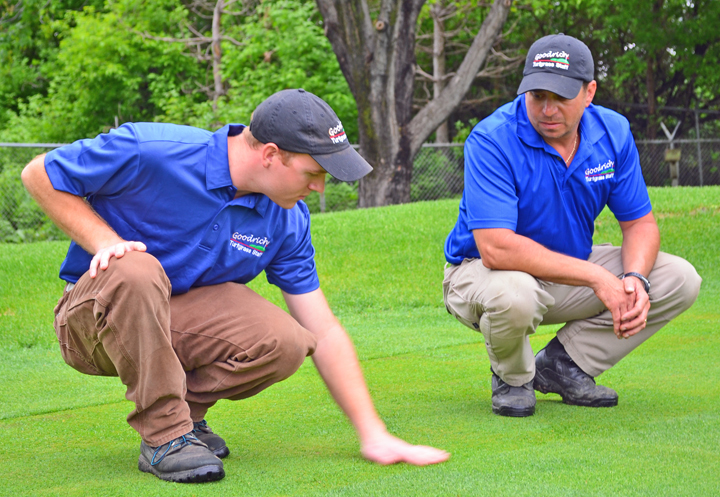 It’s Mark Newton and Eric Swanson’s job to maintain the grounds at historic Keller Golf Course in Maplewood, but the members of AFSCME Local 1935 haven’t moved a pin or filled a divot in over a year. Newton and Swanson will shake off the rust July 19, when Keller reopens for public golf after closing for major renovations to both the course and the clubhouse Oct. 1, 2012. 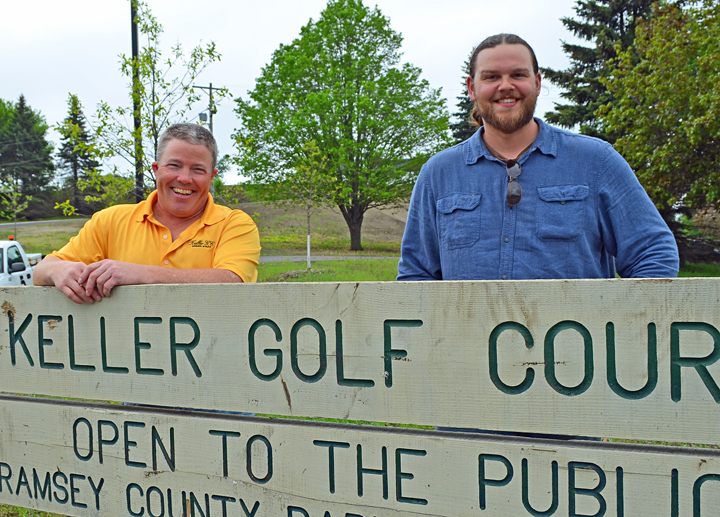 Keller, located at 2168 Maplewood Drive, is the crown jewel of the Ramsey County Parks Department’s five courses. A mainstay among industry lists of Minnesota’s top public courses, Keller’s rich history includes playing host to PGA Tour events that drew Sam Snead and Arnold Palmer. Anticipation is high for Keller’s reopening, but the temporary closing meant an uptick in play at nearby Goodrich Golf Course, another Maplewood track, located at 1820 N. Van Dyke Street. Scott Weik, a lead maintenance worker at Goodrich, said the increased traffic has been good for Goodrich’s exposure, and the course withstood the additional rounds beautifully. Last summer, Weik and Dakota Garnder, a parks aide who, like Weik, has experience working with turf, reconstructed the green on hole No. 6 at Goodrich. They dug out and refilled the area, laid drainage tile and seeded the new green on their own, so that the county did not have to bid out the job. This year, the pair will attempt to rebuild a practice bunker and level the tee boxes on Goodrich’s par threes. At Keller the temporary closing freed AFSCME members to tackle a backlog of jobs – stump removal, for example – that they struggle to fit into the busy golf season. And, of course, some jobs remained – namely cutting the grass. Keeping both courses up to the standards their regular players have come to expect is a point of pride for maintenance workers at both courses. One moment that stands out for Gardner is when a men’s league player from Keller – forced to switch play to Goodrich last year – commented on the quality of Gardner’s course. “Our men’s league players – or any customer, really – when they’re appreciative of what we do, they tell us so, and that means a lot,” Gardner said. Newton is looking forward to hearing familiar compliments in Keller’s 85th-anniversary golf season. • AFSCME Council 5 represents workers at Keller and Goodrich, and at Como, Highland and Phalen golf courses in St. Paul. • Hillcrest Golf Club, 2200 Larpenteur Ave. East, is owned by Pipefitters Local 455. Members of UNITE HERE Local 17 staff its banquet facilities, available for rent to non-members. Keller maintence workers Mark Newton (L) and Eric Swanson.